Greg Slade, recently crowned the UK’s National Wheelchair Tennis Champion, has been selected to be part of a world-leading new programme. Designed by Great Britain’s leading tennis charity, the Tennis Foundation, the new development programme will help Greg and six others to progress towards future international success. 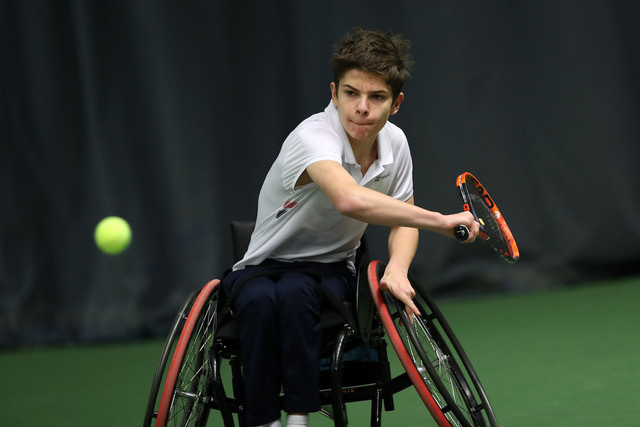 The launch of the new Wheelchair Tennis Junior Futures Potential (JFP) Programme will play a key role in the development of talented, young wheelchair tennis players in the UK. It aims to help gifted juniors progress to the first level of the Tennis Foundation’s World Class Wheelchair Tennis Performance Programme – which boasts the likes of Wimbledon Doubles Champions Gordon Reid and Alfie Hewett at its pinnacle. The JFP programme comprises six two-day training camps from February to December 2018, covering everything from coaching and performance to elite sport education. The first of the camps took place in London this weekend, with seven talented juniors making their way to the National Tennis Centre for two days of training and development. The new initiative is considered to be at the cutting edge of junior wheelchair sport development programmes across the world. With an opportunity to seamlessly advance to the first level of the Tennis Foundation’s World Class Wheelchair Tennis Performance Programme, the future certainly looks bright for Greg and his fellow young GB stars.